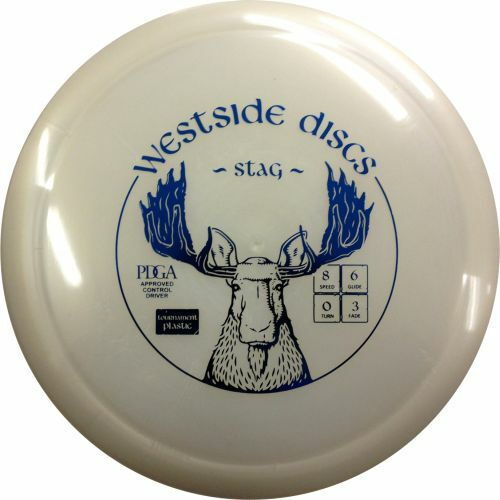 The Westside Tournament Stag is a stable fairway driver that is precise and reliable. With a smaller rim design and good release it is great for any player. This disc golf driver has a straight flight path and amazing glide. Professionals will find the Stag to be a straight tunnel disc that finishes with a hyzer. Lower arm speed players will see it finish left with a little less flare than other drivers with the equivalent flight level. Inside rim diameter 17.4 cm. Tournament plastic has the same durability as VIP but a tackier grip and a softer feel in opaque colors. It is faster out of the hand and breaks in easier.